Although currently residing in Boston, there was a time--before I went to college, that I lived quietly at home with my parents and my dogs. That place was called Cape Cod, a vacation spot for many but for me, my dear old homeland. Quite surprisingly, Cape Cod has a bit of a horrific past, filled with murders and unsolved gruesome murders at that. Plus JAWS was filmed on Martha's Vineyard so that's... scary. You also may have heard of Cape Cod as where the Mayflower first landed or perhaps you heard of it in Men in Black and Men in Black 2...a terrible terrible representation of my best friend's hometown, Truro. 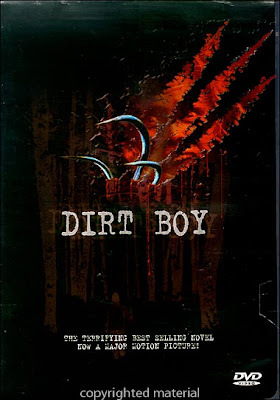 Speaking of best friends, that same best friend Isadora (Izzy on the streets) recently presented me with an Indie flick from 2001, shot on Cape Cod called Dirt Boy. At first glance I figured I was in for another teeth clenchingly bad indie film. What makes it more challenging is that I felt an obligation to enjoy it seeing as it's from my old stomping grounds. There's something funny that happens when you see a film, or read a book that takes place where you are from. I remember reading a kids horror book that took place in Eastham more than a few times while at the library. Looking back it was probably terrible, but I loved it because they said my town's name and spoke of places that I KNEW about, places right down the street from my house. In a slightly more embarrassing example, I must admit that I am forced to watch the atrocious Summer Catch, starring Freddie Prinze Jr., every time it comes on TV. Not only do they show my town's newspaper, but the whole movie is about the Cape Cod Baseball League---and come on it's Freddie Prinze Jr. So anywho after a few weeks of neglect I decided it was time to give Dirt Boy a chance. The plot seems like nothing new, and is in fact very similar to the likes of In the Mouth of Madness and Basic Instinct. Guy from New York comes down to the Cape to take a criminology seminar. 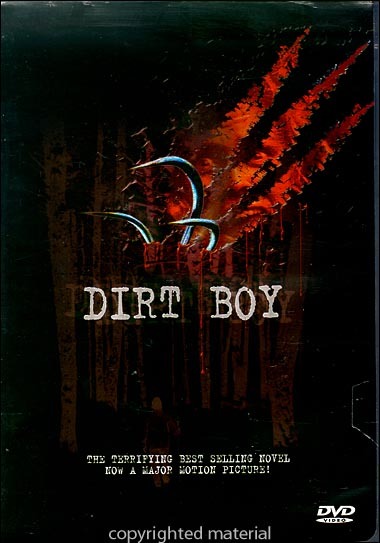 The town that he stays in, is well known for the book that takes place there, Dirt Boy- a book that retains a little too much fanaticism in the town if you ask me. Anyways, our main guy--Matty Matthews starts doing a little detective work on his own and finds that every murder described in the book, leaves a real body to be found exactly as it is depicted. Once the press catches on, the remaining bodies are moved from their hiding places and Matty must uncover the truth before his life is put in danger. The thing about Dirt Boy is that it's one of those slow burners. In fact, I wouldn't even call it a horror movie, more of a murder mystery or as Netflix strangely dubs it an "understated" film. There's a heavy air wafting throughout- and perhaps that is what struck me the most. The director's ability to capture the suffocating nature of Cape Cod in the winter. Perhaps you won't know what I am talking about if you haven't lived there yourself, but the atmosphere is as Marty Mcfly would say---heavy. It's all very ominous, and puts you right on track to expect an ultimate creep building experience. Unfortunately, things stay mostly on one level and don't rise to anything spectacular by the time we get to the film's conclusion. This is highly problematic for most of the people that viewed it on Netflix. I on the other hand was still dumbfounded how un-indie film it looked, sounded and felt. Save for a few moments of bad writing and delivery and one bad CGI explosion, the film could have fooled me into believing that it was like you know.... REAL! Sure, there are things that are weak--Matty's junkie past is never really given a proper explanation or revisiting, and his entire back story feels a little on the thin side. Plus Matty has braces and that is just distracting. But overall I was pleasantly surprised at it's quality. Acting that doesn't make you cringe, and voice overs that work and radio voices that really sound like radio voices. It's almost too good to be true. Even cinematography that looks like cinematography and not like someone just pointing a camera at something. So maybe I got caught again by the homegrown produce is better than the other stuff bug (I just made up that saying, does it work? No? Damn it. ) but whatever I enjoyed the film for it's quiet eerieness and great quality. Check it out if you wish on Netflix Instant but don't hate me if you think it's utterly terrible. I'm biased! I still think it might be a hidden gem of the indie world but what do I know? yay! im glad dirt boy entertained you. you definitely have to go back and look for my dad's cameo. its a little creepy but also hilarious. and that guy painting the town sign and staring matty down? that's my mom's ex bf. craazy. was there ever a movie done about tony chop chop? (probs not) maybe they'll do one about the christa worthington murder? the outer cape during winter.. definitely heavy. and creepy. but also i love it. Evolution of a Fear: Andre and the Shark.